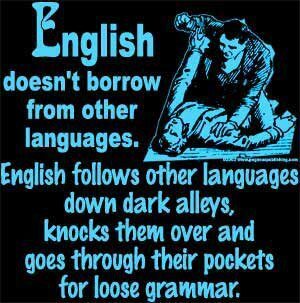 I have a t-shirt that says, "The English Language: Carefully cobbled together by three blind dudes with a German dictionary." There's a sort of spiritual truth to both . . . I saw it on my agent-sister Zina Petersen's fb page and couldn't resist stealing it. Which seemed only fair considering the subject. That's funny; I like it. Welcome to the blog, Stina!